This article presents Abu’l-Qasim Khalaf ibn ‘Abbas al-Zaharawi, Arabic أبو القاسم خلف بن عباس الزهراوي, Latin Albucasis (936-1013 A.D.), one on the most outstanding Arabic physicians and the most remarkable Arabic surgeon. His work had a strong impact in middle ages. Greek-Roman surgery had almost ceased to be practiced, in the Western world, after Paul of Aegina (625-690 A.D.), the last Byzantine compiler. Albucasis took for himself the task of making of surgery an honorable art. He recovered ancient surgical texts from damaged scrolls, developed, expanded and refined Greek-Roman operations, adding his own pioneer techniques, procedures, and devising his own instruments. His clear and insightful teachings laid the foundations of accurate and safer surgical procedures that were adopted in the following centuries. During Galen´s life (129-217 A.D.), magic and supernatural thinking was already replacing the brilliant Greek rational medical thought of Hippocratic times and from Herophilus and Erasistratus’ Alexandrian Medical School. Galen’s studies on anatomy and physiology, performed on animals, were the last achievement of Greek-Roman medicine. Later Byzantine authors were mainly compilers who added to previous works their personal and sometimes very important contributes. After the fall of the Western Roman Empire, in 476 A.D., the Western populations were invaded by hordes of barbarians, and deprived of their books. Medicine and health care were in charge of monks and nuns in monasteries in which theurgic and demonic mysticism prevailed. Surgery was increasingly depreciated and became a despicable art, practiced by barbers, midwives or butchers. Arabic sciences, including medicine, were led by Arabic authors until the sixteenth century. Arabic physicians took care of the Greek-Roman legacy, translating into Arabic the Greek authors who otherwise would have been lost. Their most importance contribution was in the development of pharmacy. Arabic medicine reigned largely in Europe throughout the middle ages. (Velensky, 1908, 20-27). However, Arabs did not accept the Greek authors blindly. They analyzed their writings, often cumbersome and obscure, abstracted the essentials, and discarded the details (Ricci, 1949, p. 61). Surgery was a difficult matter. It was the last available resort, when medicinal therapeutics failed. However, “something like 120 operations were performed, at least in some places at some times, over the course of the Roman Empire” (Bliquez, 2006, p. 1). In Greek-Roman times, medicine and surgery were regarded as complementary tasks, performed with equal care and pride. Funerary monuments of doctors depict them with their scrolls and surgical instruments, as we can see on the sarcophagus with a Greek physician from Ostia, Italy, dating from early 300s A.D., housed in the Metropolitan Museum of Art, New York (Figure 1). Figure 1. Sarcophagus with a Greek Physician. Courtesy of the Metropolitan Museum of Art, New York, Nº 48.76.1. Roman doctors were buried with their instruments. Roman working people used to be buried with their professional tools and with the symbols of their arts (Kenrick, 1858, p.p. 29-30). Tombs of doctors buried with their instruments are the numerous. Publications reporting One hundred seven publications report tombs of doctors buried with heir tools, dating from the first century B.C. until the third century A.D. The tombs were found all over the Roman Empire (Künzl, 2002, pp. 32-33). Greek and Roman doctors also prepared their medicines, as the great Roman encyclopedist, Pliny the Elder (23-79 A. D.), stated. Pliny complained about patients who relied on drug dealers that spoiling everything with fraudulent alterations (Pliny, Book XXXIX, Chapter XXV, in Rackam, 1952, p. 209). The Arabs continued and improved the Greek-Roman medicine, pharmacy and surgery. Albucasis was not the only Arabic doctor who wrote on surgery. Two of the most outstanding Arabic doctors also wrote on surgery. Rhazes, Abū Bakr Muhammad ibn Zakariyyā al-Rāzī (865-925 A.D.), a physician, alchemist and philosopher, born in Iran, also wrote on surgery in his book Al–Manṣūrī fī ‘ṭ–ṭibb (chapter VII). The work was translated into Latin as Liber medicinalis Almansoris by Gerard of Cremona (c.1114-1187), an Italian scholar who worked in Toledo and translated scientific books from Arabic into Latin. Rhazes took advantage on his expertise on alchemy, and used alcohol, which he distilled for the first time, as an antiseptic, in his unguents for surgical wounds. He also used opium as an anesthetic and analgesic (Rhazes, 1497, pp. 30-35). Avicenna, Abu ‘Ali al-Husayn ibn-Sīnā (980-1037 A.D.), born in Persia, was a philosopher, a doctor, a poet, and the leading figure the Islamic Golden Age. In his medical treatise, Canon of Medicine, he included surgery amongst diet and use of simple and compound medicines (Avicenna, 1507). He presented minor and major surgery which he drew from Greek-Roman authors, adding his own experience and insights. He used sedatives, anesthetics and paid special attention to ophthalmology. However, surgery occupies a small place in his treatises (Sanagustin, 1986, pp. 84-112). Abu’l-Qasim Khalaf ibn ‘Abbas al-Zaharawi, Arabic أبو القاسم خلف بن عباس الزهراوي, known in Latin Europe as Albucasis, Bucasis and Alzaharavius (936-1013 A.D.), was born of Spanish parents at El-Zahra, near Cordova, in Spain. There is little material on his biography. His most outstanding work was Altasrif, an encyclopedia of medicine and surgery, consisting of two parts, and each of fifteen sections. He borrowed from Rhazes parts dealing on anatomy, physiology and dietetics, with little original material (Campbell, 2006, pp. 85-86). Galen was the main source on these matters for these authors. His books were translated into Arabic. A manuscript from the ninth century, translated into German by Max Simon (Simon, 1906). Albucasis’ treatise, Altasrif, is divided in three books. His main sources are Hippocrates (460-370 B.C.) and Paul of Aegina (625-690 A.D.). Albucasis also gave valuable contributions to medicine. He described accurately hemophilia, for the first time, as well as hydatid cyst, lacrimal fistula and ear polyps and explained a case of hydrocephalus by birth defect, caused by obstruction to drainage of the cerebrospinal fluid (Cambra, 2003, 13). Chapter XVIII, on pharmacy and pharmacology, was also translated into Latin, and known as Liber Servitoris. It was a leading manual on collecting, preparation and administration of simple mineral, vegetable and animal medicinal products (Engeser, 1986, IX). It represents an early example of chemistry applied to the practice of medicine (Campbell, 2006, 90). Albucasis’ ‘Surgery’ was published separately. It is his most original and valuable work. It was a major contribution to the development of surgery in Western Christian nations (Leclerc, 1861, p. vvii). In the twelfth century, it was translated into Latin by Gerard de Cremona (c. 1114.1187), born in Cremona, northern Italy who later moved to Toledo, and was the most outstanding translator from Arabic to Latin born in Cremona, northern Italy, who moved to Toledo and is the most outstanding translator of the Toledo translation school. 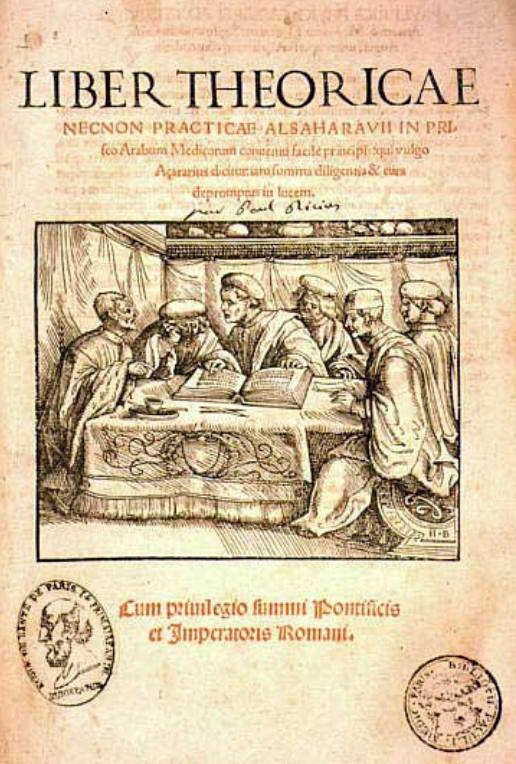 Albucasis´ work is at the basis of surgical treatises of earlier medieval authors. His contributions to ophthalmology, and dentistry and stomatology are remarkable (Cambra, 2003, 11). The ‘Surgery’ was the most accomplished attempt to recover and apply the ancient Greek-Roman technique that almost ceased to be practiced, in Western Europe. After Paul of Aegina, the knowledge of surgery had been slotted out and its remains were lost. Albucasis wrote for the skilled practitioner of operative surgery that was totally lacking in his land and time. There was nothing left except a few traces of the books of the Ancient, which have come to him corrupted by the hands of scribes, subjected to error and confusion, what made their meaning obscure and their value diminished. For that reason no skilled surgeon was to be found in his days. As he stated: Though many are doctors in name, few are in reality, particularly on the surgical side. For that reason he: “decided to revive this art by expounding, elucidating, and epitomizing it” in his treatise (Spink & Lewis, 1973, p. 2 (Albucasis, Altasrif, Book I, Intr.). It is divided in three books. The first deals with cauterization which he widely used, possibly influenced by Indian medicine in which cauterization was also widely used (Jin & Gondal 1896, p. 184). The second book, based Paul of Aegina, deals with general surgery. The third is dedicated to bone injuries (Campbell, 2006, 85-88). Physiology and surgery had few competent researchers, both is Islam as in Christianity during middle ages, due to the taboo of human dissection. In this period, less books were written on surgery than in any other field on medicine. In the ninth century, Hunayn b. Ishaq started to translate into Arabic the ancient Greek texts on anatomy and surgery. Hindu surgical tradition also had influence on Arabic surgery (Cambra, 2003, 13-14). Albucasis advised the study of anatomy. The knowledge of anatomical structures was absolutely necessary because only anatomy could guide the surgeons’ hand, and he gave examples of disastrous results when doctors acted, having no knowledge of what they were incising. He gave other sound advices to those who wished to practice surgery: to assess the condition of the patient, to act only when they are experienced, and not to act for greed (Leclerc, 1861, pp. 5-6 (Albucasis, Altasrif, Book I, Intr.). He also advised surgical experience and practice. Very threatening illnesses or difficult to cure should be left alone (Spink & Louis, 1971, p. 6 (Albucasis, Altasrif, Book I, Intr.). Some surgeries should only performed by skilled and experienced surgeons. His description of the drainage of a liver abscess by the cautery that “should not be employed except by one who has a long experience of the medical art and who has frequent practice at dealing with this kind of disease” (Spink & Louis, 1971, p. 88 (Albucasis, Altasrif, Book II, Chapter XXXI) is particularly stunning. Albucasis marks the place of the swelling with ink before the operation, a quite modern procedure of which he is also a pioneer. His procedures are correct, accurate and adequate. Albucasis performed and described almost all surgeries, carried out by Greek-Roman authors. He does not refer to just a few operations like amputation of a gangrenous uterus by vaginal approach, described by Soranus of Ephesus, not described by Paul of Egina, certainly because he had no access to the ancient texts. He often provided a much better description of Greek-Roman surgical procedures, and largely improved ancient operations with a better technique. He evaluated carefully the preoperative risks for surgeries, a procedure that we sometimes find in Greek-Roman authors, launched by Albucasis as a systematic procedure. Let us take the example of embriotomy, an operation of which we know almost nothing except for the surviving texts. We have no idea what the survival rate might have been. We just know that the operation was performed because the successive descriptions present improvements. In a text cited by Aetios of Amida (505-575 A.D.), Philumenus, probably a younger contemporary of Galen (130-210 A.D.) (Ricci, 1950, p.6), advises the examination of the woman, as a preoperative assessment. He describes signs that indicated that a woman in poor health condition would not survive (Ricci, 1950, pp.32-33 (Aetius, Gynaecolgy, Chapter XXIII). Previous descriptions of embriotomy do not mention preoperative clinical assessment. Neither the treatise that usually comes along with the Hippocratic Corpus (5th– 4th century B.C. ): “On extraction of the dead foetus” (Coxe. 1846, pp. 321-323), nor the writings by Celsus (c.25-c.50 A.D.) (Celsus, De Medicina VII, 29 in Hendersen, 1938, II vol, pp. 455-61). Soranus of Ephesus (c. 98-323 A.D.) advises against underlying dangers that may supervene after embryotomy (Temkin, 1956, p. 190 (Soranus, Book IV, III, p. 9). Paul of Egina summarizes the texts by Soranus and Philumenus (Adams, 1846, Vol. II, pp. 387-389 (Paulus Ægineta,Book VI, Chapter 74). From these authors, only Aetius provides some insights on preoperative assessment. That may help to understand how some women survived. Aetius, in a text by Aspasia, a woman doctor of whom nothing is known, except for the texts that Aetius copied, provides the management of the patient after embryotomy (Ricci, 1950, pp. 35-36 (Aetius, Gynecoligy, Chapter XXV). But this is a rare follow-up procedure. Albucasis is much more complete, providing preoperative assessment, clear description of the operations, describing surgical instruments, and post operative follow-up especially in Book III, when dealing with bone injury. Like Paulus Aegineta, his principal source, he draws both on the writing on his predecessors and on his own experience. He describes many operative procedures and instruments which do not appear in extant classical writings which may therefore be regarded as his own, or at least as being part of distinctly Arab practice. The following instances merit special attention in this respect. Figure 2. 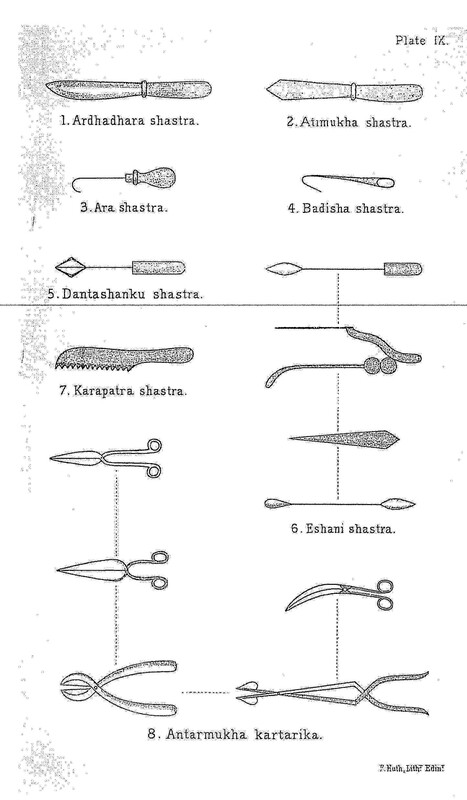 Indian Surgical instruments (Jee, S.B.S., A short history of Aryan medical science, 1896, Plate IX). When dealing with treatment of entropion, he also called for the doctor’s creativity: “The experienced practitioner will make use of his skill in many ways he can re-establish the natural form or approximate to it.” (Spink & Louis, 1971, p. 226 (Albucasis, Altasrif, Book II, Chapter 14). Writing for his fellow doctors, Albucassis was aware of the importance of conveying images of the instruments for the teaching of surgery. Greek-Roman and Byzantine authors left no drawings. No ancient catalogue has come to us. But ancient doctors seem to have known the instruments very well, since there are quite similar whatever their provenance in the Roman Empire. As the Scottish doctor and surgeon, John Stuart Milne (1806-1873), noted, they had always some kind of air de famille (Milne, 1907, p. 18). Albucasis operated according to Greek-Roman and Byzantine descriptions of the procedures. He cites their instruments in his descriptions. But other instruments have been adapted, as the French doctor and medicine historian Lucien Leclerc (1816-1893) noted (Leclerc, 1861, p. XII). The tools that Albucasis portrayed share vague resemblances with Greek-Roman tools. Some similarity with Indian instruments is apparent. Albucasis mentions copper or iron from India or even China for their manufacture. Chinese copper, for example, is one of the materials indicated for explorers; bronze or Chinese alloy for cupping glasses (Spink & Louis, 1971, p. 348 and p. 360 (Albucasis, Altasrif, Book II, Chapter 46). This faraway provenance should not surprise us, since “Islamic civilization was a lake into which flowed streams from many civilizations: Greek, Roman, Egyptian, Mesopotamian, Byzantine, Persian, Indian and even Chinese “ (Nasr, 1999, Foreword). 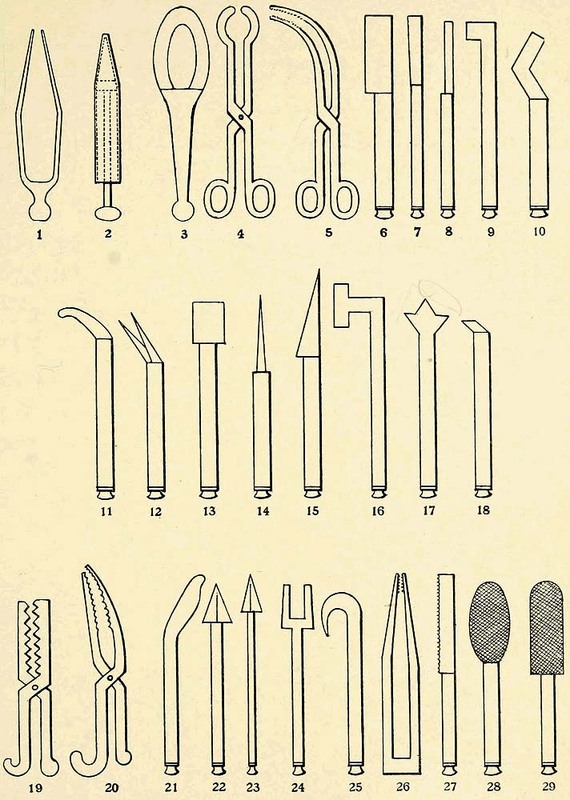 If we take a look at some Indian scalpels, cauteries and probes (Figure 2) and to a set of Roman tools (Figure 3, Figure 4), and some scalpels, cauteries and probes from an Albucasis’ manuscript (Figure 5), a striking difference comes out immediately. Most Indian and Albucasis’ tools are provided by mandrels to which handles were attached, what made more them more effective and easier to use. Just a few are double instruments, while almost all Greek-Roman tools were of double use, with exception for specula, forceps and tweezers. Figure 3. Set of Roman instruments from the ‘Case of the surgeon”, Torre D’Ares, Portugal, 2nd/3rd centuries A.D. (Vasconcellos, 2008, pp. 73-74). Figure 4. Set of Roman instruments from the ‘Case of the surgeon”, Torre D’Ares, Portugal, 2nd/3rd centuries A.D. (Vasconcellos, 2008, pp. 73-74). Figure 5. Albucasis, Chirurgia Albucasum,Illumination 14th century, Folio 34 recto, Collection: Wellcome Images, British Museum Add. Ms. 36617; Wellcome M0004103). Roman scalpels usually present a leaf-shaped plain leaf-shaped spatula, used as a blunt dissector (Figure 6 – Provenance: unknown. Copper alloy, Length: 84mm, Bus 54. Courtesy 0f the Lisbon National Museum of Archaeology.). Greek-Roman instruments were not provided with mandrels. Albucasis’ scalpels display a different shape and have no spatula as a handle (see on Figure 4, the third instrument, counting from the top). Albucasis devised numerous scalpels accurately shaped for their purposes. 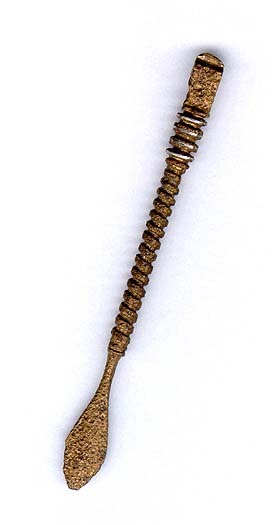 Most Albucasis’ instruments like bone levers, gynecological specula and dilators, among many others, look quite different, although they are devised for the same purpose. 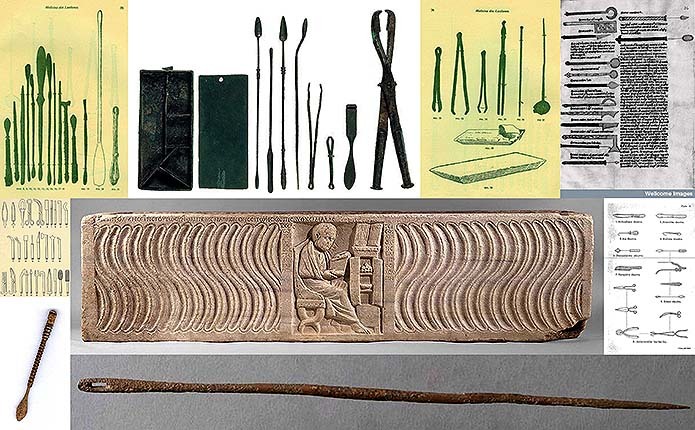 Albucassis’ tools for dentistry and stomatology surgery, in which Albucasis introduced remarkable advances, also look quite different from Greek-Roman tools. If we put side by side tw samples: a Roman dentistry case (Figure 7) and Albucasis’ dentistry tools (Figure 8), we will note that Albucasis’ set displays more typologies, and that new tools have been added to the Roman dentistry instrumentarium. Albucasis’ tooth forceps (Nº 19 and 20 on Walsh Plate) do not resemble the Roman forceps, although both have straight jaws and are indicated for extraction of anterior teeth. There are Roman forceps for extraction dental roots, although their shape is also different from Albucasis Nº 20. There are different typologies of Roman dental forceps. Some seem to have been multifunctional, being also used in bone surgery and in the extraction of arrows. Two typologies for the extraction of anterior and posterior teeth are clearly dental (Dude, 2006, pp. 101-108). Figure 7. 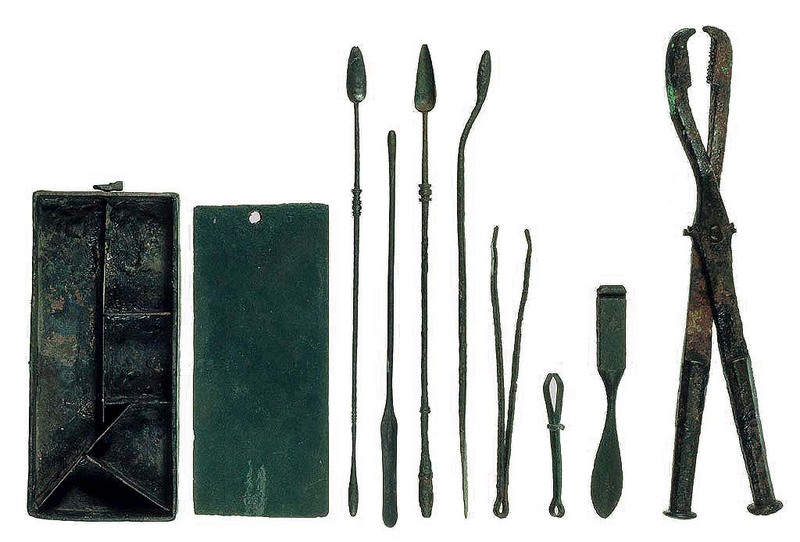 ‘Dentistry Case’, Bustorff da Silva Collection, 2nd/3th century A.D. From left to right: rectangular box to store medicines and lid; spoon-probe; spatula-probe; triangular spoon-probe; periosteal elevator; tweezers; small tweezers with sliding ring; scalpel handle; dental forceps (Alves et alli, 1995, p. 114, Figura 201). Figure 8. Albucasis dentistry instruments: 6 to 20- Instruments for the treatment of the teeth. Figure 8. Albucasis dentistry instruments: 6 to 20- Instruments for the treatment of the teeth. 19 and 20- Forceps. 21 to 23 – Levers and hooks for the removal of roots. 26. Strong pinchers for the same. 27. A tooth saw. 28 and 29. Files for the teeth (Walsh, 1920, Plate unnumbered, after plates selected from Gurlt, 1898, Tafel IV, Vol. 1, Tafel IV, p. 648). The forceps for extraction of posterior teeth had down curved jaws, like the forceps from Wederath, Gallia Belgica from the 2nd century A.D. (Kunzl, 1982, p. 71, Abb. 45). No instrument with this function figures in the Albucasis’ sample. But it is possible that Albucasis had more than the two forceps for teeth extraction. He referred that there were too many instruments in this area, and that we could not copy them all. 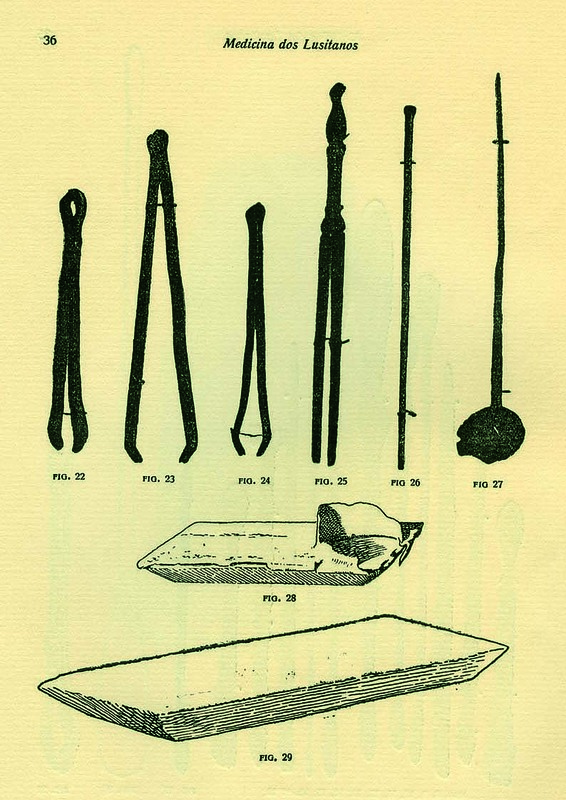 Some Roman tools were richly decorated (Figure 9). 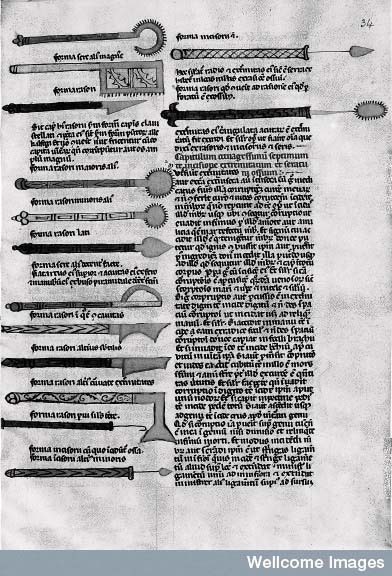 Some Albucasis’ cauteries, knifes and needles also display decorations on the manuscript drawings (See Figure 5). Ancient surgeons did not know that microorganism attach to decorations and provoke postperative infections. But Albucasis was surely aware of the risk of infection related to surgery. He used chemicals which have proved anti-bacterial properties. He also introduced important organic materials like catgut in intestinal stitches, for the first time. He used henbane for anesthesia (Arslan et al., 2014, pp. 103-104). Cotton was also widely used to apply medicines and for other purposes, for the first time, in this book. When dealing with treatment of bone injury, Albucasis refers to stiff plasters. In the repair of a broken jaw: a plaster of mill-dust and egg-white, or white flour, after removing wax, and applying soft tow over the plaster (Spink & Louis, 1971, p. 716 (Albucasis, Altasrif, Book III, Chapter 4). This was a valuable contribution to immobilize fractures, beside splinters and bandages attached by sewing needles, in Greek-Roman surgery (Figure 10). 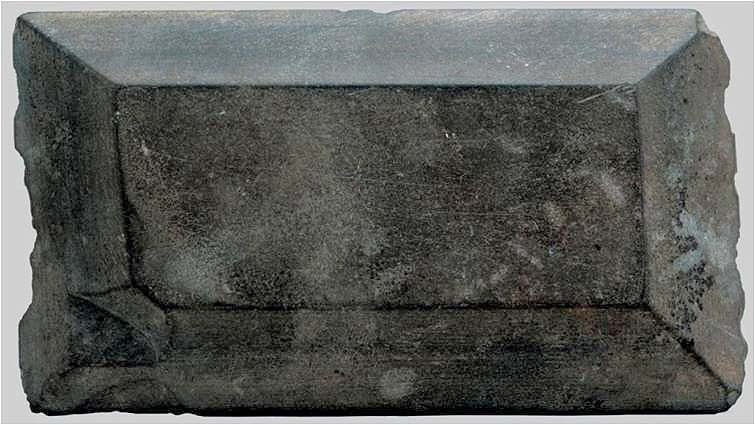 The set of Torre d’Ares displays a slate to prepare medicines (Figure 11). The ‘Dentistry Case’ displays a box for storing of medicines. These items do not figure amongst Albucasis’ tools. The Roman sets included instruments like spatula, spoons, slates and boxes to store medicines because doctors prepared their medicines. By the beginning of the ninth century, pharmacy was separated from medicine. Arabic pharmacy had emerged from alchemy. It began by focusing in the interest on poisons and antidotes, and extended to other areas outside toxicology. Bagdad was its first center where its school of thought was established. The Saydanah was the pharmacist (the word is derived from sandalwood). Private owned pharmacy shops rapidly extended to the suburbs and to other Muslim cities (Tschanz, 2003, pp. 11-17). Albucasis’ contribution to pharmacy is also remarkable in this book. His teachings were followed by Arabic and European surgeons. 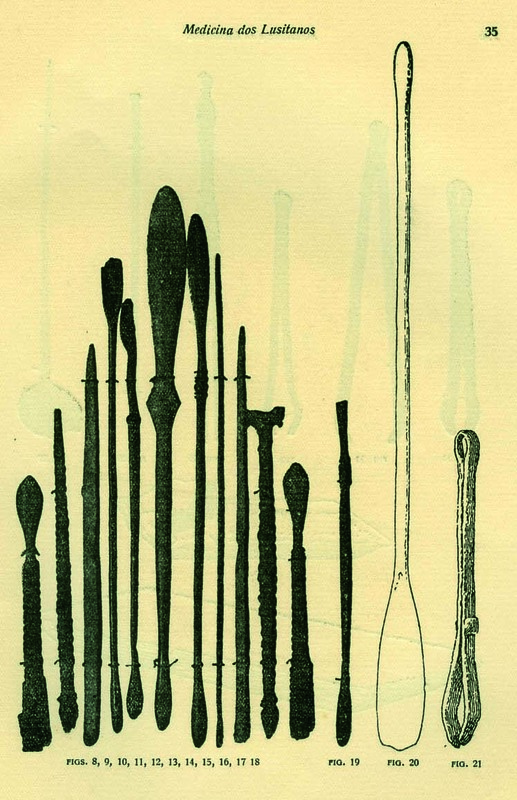 Some instruments, concerning areas in which Albucasis’ tools had great impact, were copied in the following centuries. Caratact needles, dental instruments or gynecological and obstetric tools, portrayed in Albucasis’ drawings, have no similarity with surviving Greek-Roman instruments to which we have access from archaeological excavations. Albucasis’ instruments provided the model for the following centuries. Guy de Chauliac (c.1300-1368), the father of French Surgery cited Albucass frequently in his work. Most of instruments that figure in the treatise by Guy de Chauliac are copied from Albucasis’ ‘Surgery’ (See Chauliac, 1980, p.691). Most Arabic and Greek-Roman surgical procedures only started to be corrected from the sixteenth century onwards. Recasting the splendor of Greek-Roman medicine, Albucasis conveyed knowledge from Eastern medical traditions. He provided his clinical experience and pharmacological knowledge to a reborn surgery, establishing new procedures and instruments that made operations more accurate and safe. Albucasis´ pioneer thought and practice became a landmark for Arabic and European surgery. I would like to thank the Metropolitan Museum of Art of New York, the Wellcome Trust, and Dr. António Carvalho, Director of the Lisbon National Museum of Archaeology for the kind permission to reproduce the images. I would also like to thank Professor. Lino Cerejeira from the Dentistry Medical Faculty, Lisbon University, for the kind help in identifying instruments.